You may know that from Java SE 7 onwards, you need to pass two exams to become a certified Java developer e.g. OCAJP and OCPJP. The first one is an associate level exam and it's rather easy to pass, but the second one OCPJP is a professional level exam and it's much harder than OCAJP. If you are giving the Oracle Java certification then you should know that you need to pass OCAJP before taking OCPJP exam. This is also the second part of an article about books to prepare Java SE 7 certifications. In the first part, I have shared best books for OCAJP7 and in this part, I am going to share best books for the OCPJP7 exam. You might know that there are two professional level exam, 1Z0-804, and 1Z0-805, the first one is known as OCPJP7 while the second one is known as an upgrade to Java SE 7 certification, which you can give to become certified Java SE 7 developer if you already passed SCJP 5 or OCJP 6 exam. The books recommended in this article is applicable to both OCJPJP7 (1Z0-804) and upgrade to Java SE 7 (1Z0-805) exams. Choosing the right book to start with your preparation for OCPJP7 is very important for your success. As I mentioned before, there are three key steps to clear the Java SE 7 exam, the first one is choosing the right book, the second one is daily writing Java program to understand concepts, and the third one is doing mock exams like Enthuware or Whizlabs OCAJP7 exam simulator. If you don these three steps properly, you will most likely receive a good score, something in the range of 90 to 100%. Don't go for memory dump because they are not worth of effort. One objective of taking Oracle Java certification is to learn more about Java and increase your experience, dump just ruin that part. Anyway, let's see some good books to prepare the OCAJP7 exam. 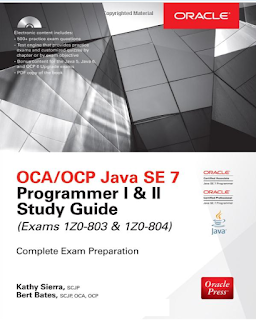 Here are some of the best books to prepare for the OCAJP7 exam also known as Java SE 7 Programmer II certification or 1Z0-804 exam. As I told you before, the books shared here is good for both OCAJP7 i.e. exam code 1Z0-804 and Java SE 7 upgrade exam with code 1Z0-805. So, if you are a certified Java developer and wants to upgrade to Java SE 7, then also you can refer this books to start your preparation. 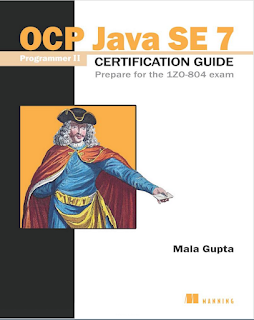 I am a big fan of Kathy Sierra books, having read their Java certification guide from Java 1.4 to Java 1.7, but I must say this Mala Gupta book is current the best book to prepare for the OCPJP7 (1Z0-804) exam. If you remember, Mala Gupta is also the author of OCA Java SE 7 Programmer I Certification Guide, which is also one of the best books for OCAJP7. She also holds the OCPJP certification so you are assured of the first-hand experience. This book provides 100% coverage of the OCPJP7 exam objectives (1Z0-804), also known as Java SE 7 Programmer II certification. The book is full of flowcharts and UML diagrams and focuses on hands-on coding exercises, which is very important to understand the subtility of different Java concept. It also comes with bonus online chapter containing mock exams, similar to Whizlabs OCPJP7 exams. This is another good book to prepare for both OCPJP7 exams (1Z0-804) and Java SE 7 upgrade exam (1Z0-805). The book has got a really long name e.g. 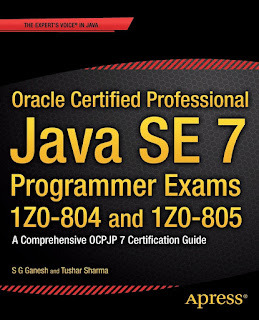 Oracle Certified Professional Java SE 7 Programmer Exams 1Z0-804 and 1Z0-805: A Comprehensive OCPJP 7 Certification Guide : An Expert voice in Java, but it's popularly known as OCPJP guide by S.G. Ganesh and Tushar Sharma. The book is completely focused on OCPJP7 and covers exam objectives in good details. It also contains 2 mock tests to give you a sense of a real exam. It also comes with an instant refresher which summarizes the most important concepts for quick revision before you go for the exam. This is the Kathy Sierra book for OCPJP7 certification which you might be looking. No doubt its a great book and covers both OCAJP7 and OCPJP7 exam objectives. The electronic version contains not just the PDF copy of the book but also contains 500+ practice exam questions and a test engine that provides practice exams and customized quizzes for different exam objectives. The book also contains some bonus content for the Java 5, Java 6, and OCP 6 Upgrade exams, which makes it suitable for all three Java SE 7 certification exam e.g. 1Z0-803, 1Z0-804, and 1Z0-805 exam. 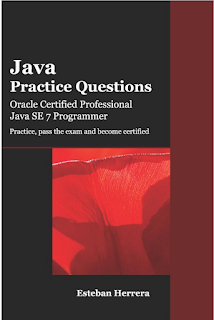 This book contains 120 practice questions for OCPJP7 exam IZ0-804, Oracle Certified Professional Java SE 7 Programmer (OCPJP). You can use this book in conjunction with Enthuware and Whizlabs Exam simulators. It will Strengthen your knowledge of the eight topics covered by the exam. It contains 10 questions from each exam topic, there are total 12 topics hence 120 questions. To be honest, 120 questions is seriously not enough, compare that to 500+ questions from Enthuware but each question is well thought out and tries to point out the tricky part, which you will see in the real exam. In short, a good companion book along with any of the above study guide for OCPJP7. Here are some of the useful links for more information and resources on OCAJP7 (Java SE 7 Programmer II certification) with exam code 1Z0-804 and Java SE 7 Upgrade exam 1Z0-805. This link contains exam objectives e.g. all topics and also provide some sample questions to prepare the OCPJP7 exam. Which Java Certification should you take? OCAJP7 or OCAJP8? I'll keep including useful resources on this links e.g. books, Java SE 7 mock exams, Java SE 7 practice tests, and OCPJP study notes, can bookmark this article and keep checking it later. That's all about some of the best books to prepare for OCPJP7 (1Z0-804) exam , also known as Java SE 7 Programmer II certification. The books are also helpful for an upgrade to Java SE 7 exam 1Z0-805, which you can pursue if you already hold a Java Sun certification e.g. SCJP 5 or OCJP6. If you don't have any prior Java certification then you need to first pass the OCAJP7 exam with code 1Z0-804 before taking this exam.